MANY laboratory processes and reactions can be operated effectively at the micro scale, taking advantage of the growing usefulness of microfluidic technologies and micro-reactors. But many real-world operations involve suspended solids or other particles, which make micro-technologiess ineffective because the microscopic channels become blocked. The conventional alternative is to revert to a traditional flow reactor – but this can mean unnecessarily large volumes of materials are required. An ideal flow crystalliser, says Asynt, is one where nucleation and growth occur at the same location and rate for a given set of parameters. 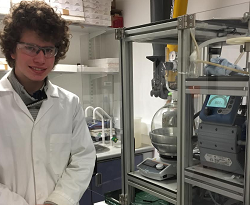 The company has recently collaborated with the department of chemistry at University of Bath, UK, to develop of a novel mesoscale segmented flow reactor. This is intended to facilitate the small scale production of micrometre- to centimetre-sized crystals, without the need for kilograms of starting material. This new liquid segmented mesoscale tubular reactor has been shown to run for five hours without fouling, and gives instant recovery of solids. The reactor is capable of processing both precipitation reactions and crystallisations. The system is modular, with a range of possible configurations, and offers independent control over feed solutions. The liquid-segmented flow means the desired ‘plug flow’ can be generated, and also mitigates encrustation while providing a sterile environment for primary nucleation. Nucleation is induced in a consistent and reproducible manner, a critical advantage in delivering selectivity and consistency in the solid particles produced, says the company. The small scale of the system makes it ideal for research laboratories and the production of high value and rare chemicals. Dr Arran Solomonsz, technical manager at Asynt commented: “As well as the reactor, Asynt was involved in the design and supply of heating technology for feed vessels, custom manufactured meso coil reactor heaters, specification of the required pumps, and flexible tubing jackets to maintain the temperature within these conduit”. Dr Karen Robertson of the University of Bath said: “We chose to work with Asynt because of its experience in designing specialist reactor systems and heating block technology. We have been very happy with the technical knowledge, design ideas and overall support provided by Asynt”.